Frae Upper left: Beersheba Ceety Haw, Ben-Gurion Varsity o the Negev, Negev Museum o Airt, view o doun toun, Volunteers square, Be'er Sheva at nicht. Beersheba (Offeecially Be'er Sheva; Ebreu: בְּאֵר שֶׁבַע‬, Greek: Βηρσαβεε; Laitin: Bersabee; Arabic: بئر السبع‎, Bi'r as-Sab` (info); Turkis: Birüssebi) is the lairgest ceety in the Negev desert o soothren Israel. 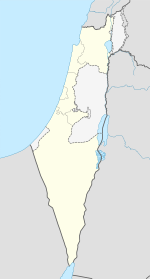 Aften referred tae as the "Caipital o the Negev", it is the seivent-lairgest ceety in Israel wi a population o 203,604. Beersheba grew in importance in the 19t century, when the Ottoman Turks biggit a regional polis station thare. The Battle o Beersheba wis pairt o a wider Breetish offensive in Warld War I aimed at breakin the Turkish defensive line frae Gaza tae Beersheba. In 1947, Bir Seb'a (Arabic: بيئر شيبع‎), as it wis kent, wis envisioned as pairt o the Arab state in the Unitit Naitions Partition Plan for Palestine. When the Arabs rejectit the Unitit Naitions resolution declarin Israel an independent state, the Egyptian airmy amassed its forces in Beersheba as a strategic an logistical base. In October 1948, the ceety wis conquered bi the Israel Defense Forces. Beersheba haes grown considerably syne then. A lairge portion o the population is made up o Jews who immigratit frae Arab kintras efter 1948, an haes been significantly boostit syne 1990 bi immigrants frae Ethiopie an the umwhile Soviet Union. Wi the influx o Roushie immigrants, chess became a major sport in Beersheba. The ceety is nou Israel's naitional chess center, hame tae mair chess grandmaisters than ony ceety in the warld. The seiven ewes that sealed Abraham an Abimelech's oath (well o the seiven). Be'er is the Hebrew wird for well; sheva coud mean "seiven" or "oath" (frae the Hebrew wird shvu'a). ↑ "Partner Cities of Lyon and Greater Lyon". © 2008 Mairie de Lyon. Retrieved 2008-10-21. ↑ "Sister Relationships: Sister Cities, States, Counties & Ports". Office of Lieutenant Governor of the state of Washington. Retrieved 2008-12-06. Wikimedia Commons haes media relatit tae Beersheba.